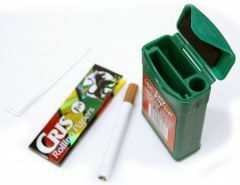 Simply POP open the Surival Kit with your thumb nail! Holds Material, Reusable Imitation Metal Cigarette, Custom Poker & 1 1/4 Size Papers. Variety of Colors Offered!